I've been on Max for just over a week now and am very pleased. I sync at the full rates and can get around 14 Mb/s download speeds from sites like speedtest.net and thinkbroadband. I obtained my router stats using the mognuts utility and this informed me that I was on Channel = fastpath (or something like that). I seem to remember reading that, in actuality, this was a router bug or something and that really I was on interleaved. Someone suggested that all new people get put on interleaved? However, I noticed that someone on here posted stats where Channel was equal to Fast. Should I be bothered eitherway? I don't play games online, so would it make a difference for the better? The last thing I want is loads of errors and my sync dropping off!! Re: Am I on interleaved? 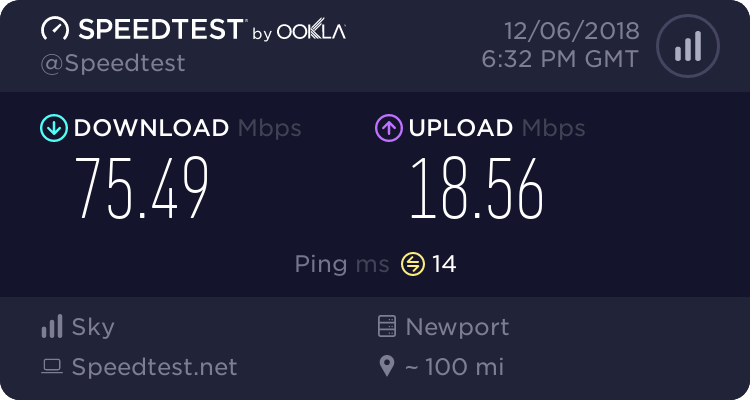 My line was activated on the 12th and my D-Link router (which is sync'ing perfectly with Sky's equipment) is reporting "Channel: Fast", so I don't think it's the case that all new connections are put on interleaved. On both the Netgear and the D-Link routers? (Not implying that that's impossible of course, they may well use the same chipset). Is there any advantage in trying to get the depth of onterleave switched down a bit. I.E. would it effect download speeds or web page loading times? Needless to say my pings are not great but does better latency help anything other than online gaming? Are these a bit high?